Long before people began shoeing horses they were barefoot or fitted with sandals or boots, the earliest being the ‘hippo sandal’. Around the 10th century the first metal nail on shoes were invented. It was not until the late 1960’s that nuclear physicist DR Neel Glass, with the plastics industry in full flow, invented the first modern hoof boot. They became available to the public in 1972. Today there are a variety of hoof boots available for the barefoot horse. Take time to do research before choosing boots that will suit your situation. Contact a professional who has knowledge of using boots and take advantage of their experience. You do not have to change your hoof care provider but getting the right boots correctly fitted can mean the difference between success and failure. When to use hoof boots. 1. Following removal of steel shoes, horses can experience a transition period while the hooves adapt to a new stimulus. (If you imagine a person taking off a pot from their arm after just 8 weeks, the limb has been weakened due to restricted movement). No horse should be expected to carry on with the level of work as when they were shod, although this can often be the case. It depends on many factors so the support of a professional with experience of taking a horse barefoot is important. The adaptive period, shod to unshod, varies from horse to horse. Because every aspect of the horses life style effects hoof health and function, it is important to take an active interest in all aspects of day to day husbandry. Keeping a diary with detailed records can make it easier to reflect on both positive and negative decisions. 2. Horses who have a variety of hoof problems can often be put in work with the use of boots, or boots and pads. Problems such as bad thrush, laminitis, ‘navicular syndrome’, periods following an abscess, thin soles etc can be helped enormously with using the protection of a hoof boot. 3. Using hoof boots longer term provides protection when necessary. Every horse is different and the need for protection will vary. The most important rule is to listen to the horse. Never ask them to work on surfaces they are uncomfortable on, this will only set them back. Many horses will get on with their job without boots. Almost all horses are OK on tarmac roads, fields, arenas and other yielding surfaces. When a horse needs to work on harsh rocky terrain then this is where some horses will just love having boots. Some riders use boots on a regular basis while others never use boots. Sometimes they are used occasionally if a horse needs to do something ‘out of the ordinary’ like going on a route involving aggressive terrain not acclimatized to or when the workload is suddenly much higher than the hoof is accustomed to. The beauty of boots is that they are used for work and then removed to turn the horse back into their living area. This means they can last a very long time. From the number of horses who use hoof boots - 99 out of 100 - have them for front hooves only. It is very rare that they are ever needed for hind hooves. Many owners in the UK have hoof boots for two years plus. It really depends on how much work the horse does and the terrain they work on. Some boots have a more robust tread than others. Do not use a boot intended for muddy conditions if you always ride on roads. 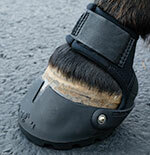 For further information on the benefits of hoof boots visit HOOF BOOTS AND PADS. A breakthrough in healing This answers all the questions surrounding the benefits of hoof boots. Enjoy ! Visit easycare. Lots of valuable information why hoof boots are such a great asset for barefoot horses along with loads of tips for getting the best from your chosen boots. Hayden Price, farrier and Rod Fisher, RCVS.